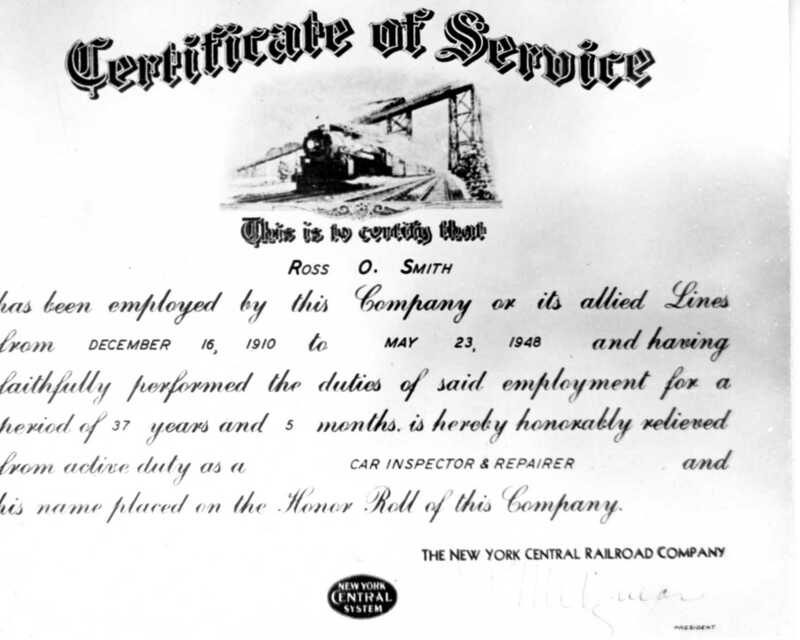 This is to certify that Ross O. Smith has been employed by this Company or its allied Lines from December 16, 1910 to May 23, 1948 and having faithfully performed the duties of said employment for a period of 37 years and 5 months is hereby honorably relieved from active duty as a CAR INSPECTOR AND REPAIRER and his name placed on the honor roll by this company. THE NEW YORK CENTRAL RAILROAD COMPANY (with a faint and unreadable signature by the then company) president. What a neat piece of history from what was indeed another age! This certificate of service reminds me of the personal items of note that used to appear in the Corning newspapers in the late nineteenth and early twentieth century. The Corning paper in its current and various previous incarnations, i.e. The Corning Blossburg Advocate The Corning Democrat, The Corning Daily Journal, The Corning Weekly Journal and of course, The Leader, may be perused at the library on microfilm. Ask the staff for more information! And if you know who Ross O. Smith was, let us know! 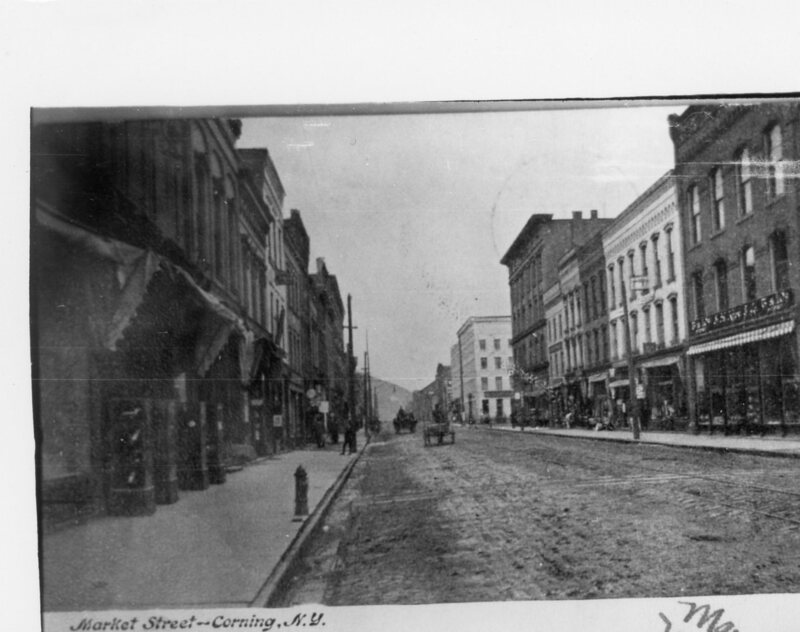 Our second photo of the week is a photo of an old postcard showing Market Street, in Corning many, many years ago – before the street was even paved, horses and carriages being the standard mode of transportation. From doing a Google Images search I found a date for the postcard, via the Hippostcard.com website – 1907. And the big white building seen on the right side of the photo is the Dickinson House – a local hotel of days gone by. 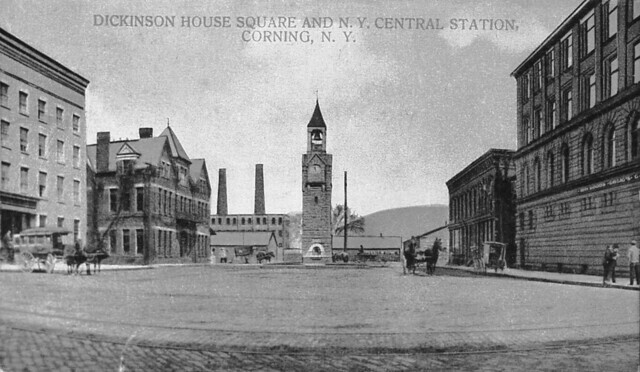 DICKINSON HOUSE SQUARE AND N.Y. CENTRAL STATION, CORNING, N.Y.